If you have ducks, they’ll need a place to live, right? That’s where our free duck house plans come in! 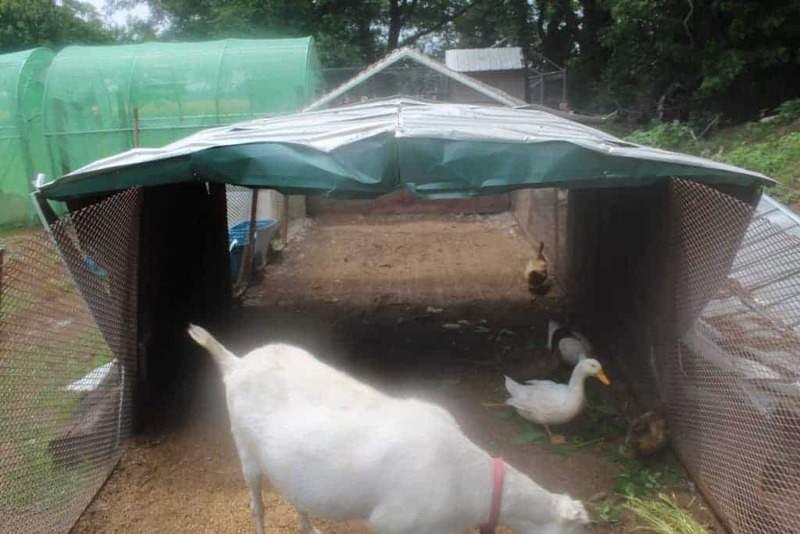 What kind of bedding should be in your duck house? How long did it take to put our plans into reality? We added 4 new ducks to our farm this year: 2 Khaki Campbells and 2 Pekins. We even hit the jackpot and managed to get both a hen and a dake of each breed! Sometimes things just work out. Since they needed a safe place to live, grow, and lay eggs (fingers crossed for ducklings! ), we drew up plans to build them a duck house for free. And, naturally, we used recycled materials. Earlier in the year, we invested a tin shed that was meant to house horse grain – until a tornado came by with other plans. To build our duck house and salvage some of the tin, we used it for our duck house. Here’s how you can build a duck house too, too, using our free plans! Perhaps more so than when building a chicken coop, the #1 thing you should keep in mind with your duck house is it needs to be safe from predators. Chickens can fly up to roost, but drakes and hens cannot, and so have one less defense than chickens should a predator enter their domain. They call easy targets “sitting ducks” for a reason, so our free plans take this into consideration. 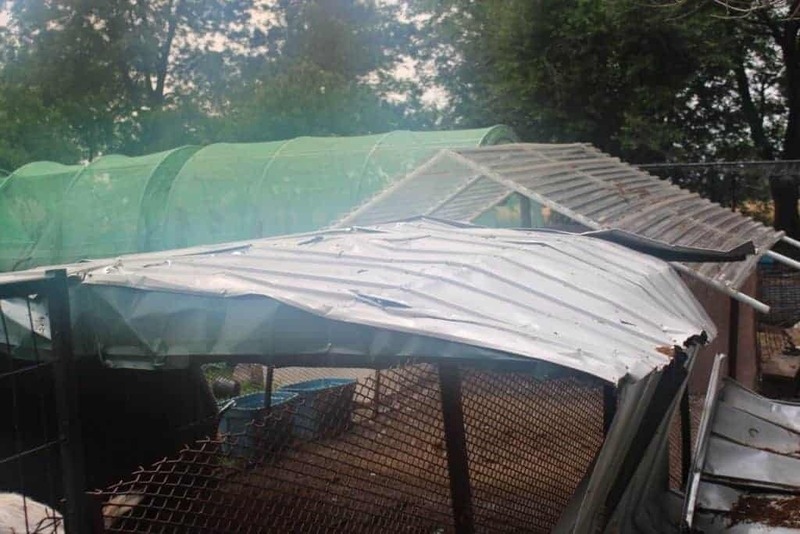 So, it’s best to build your duck house inside a safe area. We use an old cotton trailer. With it’s thick wire walls (much thicker than chicken wire), predators don’t have a hope of ripping it open, and the sides are high enough that it would take a very committed predator to jump it. Plus, it’s big enough that our fluffy butts are free to roam around a good-sized space. It’s also transportable, and can be moved every month or so to keep the parasite issue at bay. We’ve even gone a step further and given our goat, Dahlia, the job of “protecting” the ducks. She won’t actually run off a predator, but her size makes sneaky raccoons and opossums think twice about getting a free meal. To protect your duck flock, if you can’t find a cotton trailer or something similar, hardware cloth is a good option. It’s thicker and sturdier than chicken wire, and since ducks are pretty defenseless, you will want to make sure their area is secure. Next, your duck house will need to have an area that provides shade and protection from rain, snow, ice, etc. We reused an old shed we had; if you don’t have anything similar, even an old dog house would work. It’s easy to make small roof trusses with 2×6 wood, and it will be sturdy enough to last. Any free roofing material will work; you just want to make sure it will last when wind, rain, and other bad weather comes. The roof should be around 3 feet in height as a minimum, but remember that you will have to get in there to at least clean it out, or even to help a sick or hurt duck. Ours is made of recycled tin, and is 4 feet high – tall enough to allow us to get through if we’re crouching. It doesn’t look like much, but it’s been tested in 60 MPH winds during tornado season, and it’s stood it’s ground – so we know it works! We installed a corrugated plastic roof in the back so the goat has a place to lay – she loves her sun naps, and the ground stays dry. The plastic roof also has the added benefit of keeping predators (such as hawks) out while allowing for air circulation and light. You will also need around 4 square feet of floor space inside the house itself for each duck you plan to have inside. You will also want to have at least 10 square feet of outside space for each duck; this will let them feel free, and help prevent stress and pecking order issues (believe me, the drakes will bring enough pecking order drama). Our duck house plans let us have an open end on each side, but if yours will have a door, it should be at least 14 inches in width and 14 inches in height. (Remember, you will need a separate entrance for you to get into it). Since modern hens and drakes have been bred to be heavier and flightless, it’s best if your duck house is on the ground. If you really want it raised, be sure to add a ramp so your feathered friends can actually use their new home. You will also want enough space to put a kiddie pool full of water – your duck flock will undoubtedly enjoy taking baths. Ours go wild whenever it rains, we spray them with water, or the sprinkler hits them. It’s the highlight of their day! There’s lots and lots of opinions about this, but I’ve found a simple solution is to just use straw. It’s clean, dry, and easy to remove. 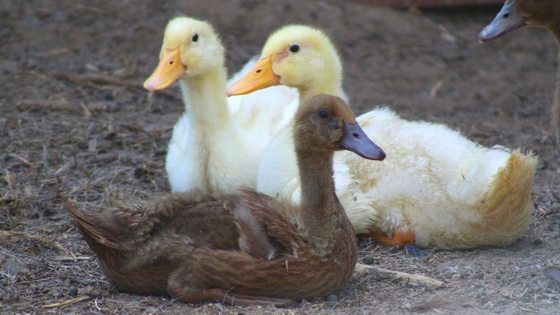 Ducks are pretty messy, and they definitely poop more than chickens. Once your hen ducks start laying eggs, they will do so on the ground. Straw will help keep the eggs clean, and give your hens a comfortable place to do their business. Like chickens, they like a bit of privacy, although ours have never used nesting boxes. Our duck house only took us about an hour to put together, once we had our plans figured out (the design might take you another hour). We all want chicken coops and duck houses that look beautiful, but what matters most is that it’s safe for your flock – so don’t worry too much about the design as long as it’s functional! Have you used free duck house plans on your farm? What are your best tips? Leave them in a comment below! Ellen I prefer straw. It’s more economical here than shavings and just as comfortable. Pellets are very handy for wet areas — especially whichever corner they choose to use as their restroom — but otherwise just don’t seem to provide as much comfort to me.